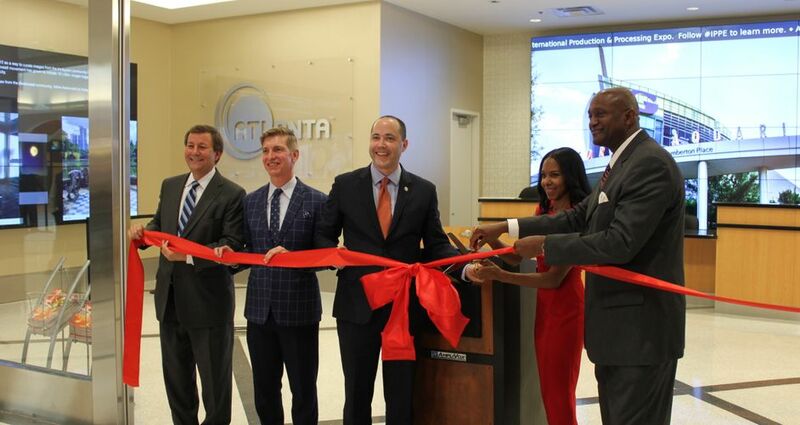 The Georgia Department of Economic Development’s Tourism division in partnership with the Atlanta Convention & Visitors Bureau (ACVB) unveiled the state’s newest Visitor Information Center (VIC) at Hartsfield-Jackson Atlanta International Airport. First Lady Sarah-Elizabeth Langford Reed, GDEcD Commissioner Chris Carr, GDEcD Deputy Commissioner of Tourism Kevin Langston, ACVB President William Pate and Hartsfield-Jackson Atlanta International Airport General Manager Miguel Southwell participated in a ribbon cutting ceremony today at the airport to celebrate the state’s first airport Visitor Information Center. The Georgia Tourism division and ACVB partnered on this project to open a visitor information center at the world’s busiest passenger airport, providing travelers coming to or through Atlanta’s airport with travel information from throughout the Atlanta area and state. The new Airport Visitor Information Center (VIC) is designed to provide travelers with a wide range of travel assistance including friendly trip-planning assistance from knowledgeable staff, travel brochures, state travel guides, travel tips and much more. The custom-designed, 1,200-square-foot facility will offer traveler-friendly hours, including evenings, in a location that is both convenient and accessible to visitors arriving to Atlanta as well as locals waiting to pick up their guests. The VIC is located at the top of the arrival escalators, allowing travelers to access the information before or after visiting baggage claim. With the newest addition, Georgia now has 12 official state Visitor Information Centers that are located on major travel arteries in Augusta, Columbus, Kingsland, Lavonia, Plains, Ringgold, Savannah, Tallapoosa, Valdosta, West Point and Sylvania. The state’s Visitor Information Centers welcome more than 13 million guests each year.